As you know, I live near Derbyshire and I’m more than happy to wax lyrical about the Peak District on Twitter. It’s a very beautiful place and definitely worth visiting. However Derbyshire is a reasonably large county (2,600km²) and there’s much more to it than wild countryside and pretty villages. In fact, much of the East and North is full of working-class towns of no real attraction; one such is Bolsover, which gives its name to one of the closer districts to my house. Bolsover itself is a fairly non-descript small town, one of those places where the dominant industry (coal, as per most of my local area) has long gone, and these days notable only for the very old-school ‘firebrand socialist’ MP Denis Skinner. It’s definitely not a place on most local’s trails, never mind tourists. It does, however, have one redeeming feature – a castle. 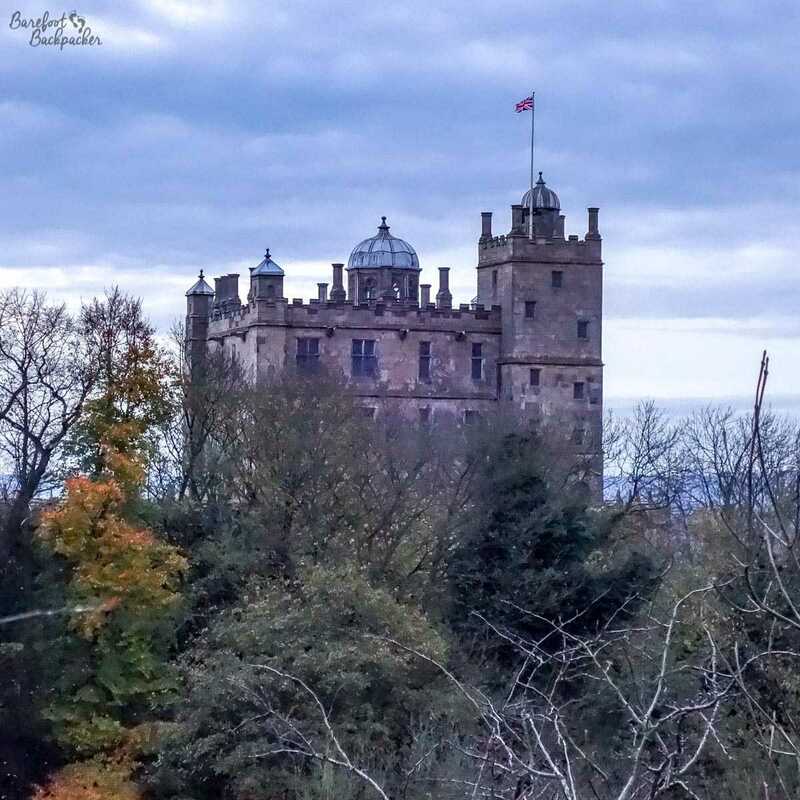 View of Bolsover Castle The lack of quality in this pic is due to being taken in civil twilight at high zoom. Because I’m disorganised. You should be grateful I can run as fast as I can! It would be nice to say that the castle suggested that in the past the town had been more important. However … although the castle was built some time in the 1100s by the Peverel family (who seemed to have owned a fair part of what is now Derbyshire (they were also responsible for the construction of Peveril Castle in Castleton, in the heart of the Peak District), it seems as though it was on its way to becoming a ruin even as early as the 1300 – evidently although built on top of a prominent hill, it didn’t have the trade or strategic value as their other holdings and became neglected. Much of the castle seems to have been rebuilt in the early 1600s, when ownership passed to the Bentinck Family (the Dukes of Portland – one of the major landowning families in Notts/Derbys area), but they only seemed to have given it a spit-wash and by the late 1800s it was again becoming derelict. It’s now owned and run by English Heritage, who occasionally put on events and re-enactments there. While it looks imposing from a distance, its history means there’s not a lot left there inside to see other than the basic shell. Wider angle view of Bolsover Castle, showing just how much of it is a façade. Bolsover does seem to have one famous person from history, however – albeit the history of Canada. Described as Canada’s equivalent of Captain Cook (retrospectively at least), Bolsover was the birthplace of Peter Fidler, an explorer, mapmaker, and pioneer at the turn of the 19th Century. He seems to have been one of the first Europeans to accurately report about the far interior of Canada – the monument to him in Bolsover describes him as the first white man to mention cactii and coal in what is now Alberta/Saskatchewan, and to report details about Lake Athabasca, including nearby tar deposits. It seems he also had a habit of naming the trading posts in the area after places back ‘home’ (including “Chesterfield” and “Mansfield”). Having explored the region, he settled in the area, married a local (Cree) woman, and had a reported 14 children, before dying quite young (53) somewhere in rural Alberta. 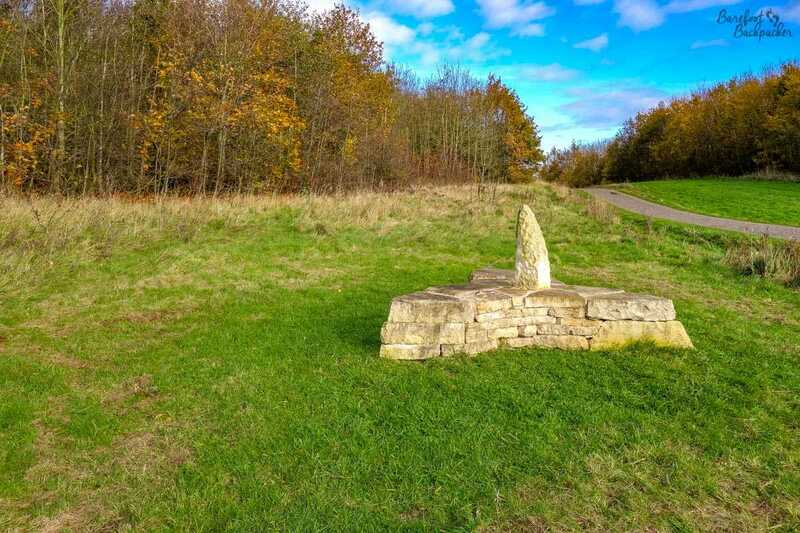 His monument in Bolsover stands in a small nature reserve and parkland that also bears his name. The memorial to Peter Fidler, in the eponymous parkland just south of Bolsover. 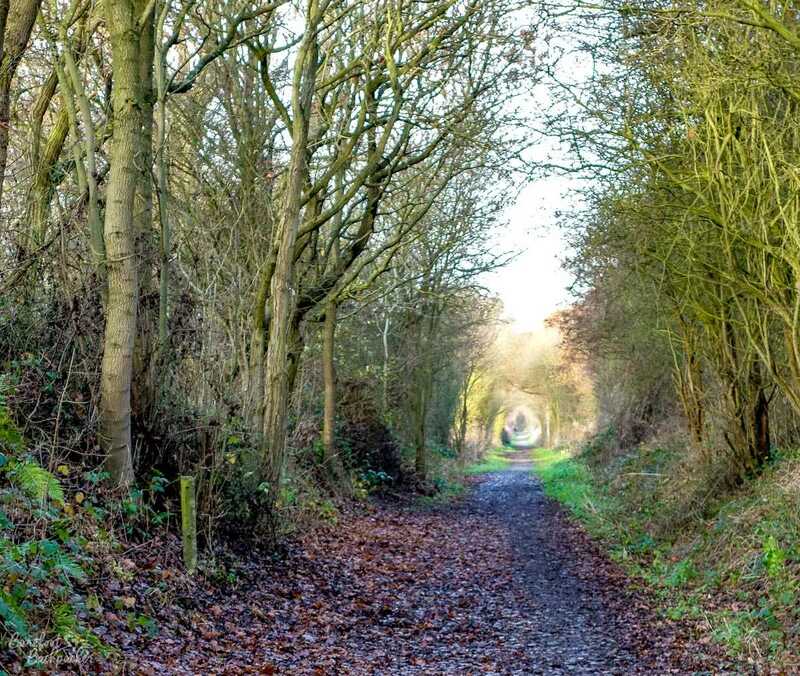 South of Bolsover lies the ‘Stockley Trail’ – a footpath that runs along the trackbed of an old railway line laid in the 1870s that linked it to the village of Glapwell. Although mainly serving coal mines, it did take passengers in its early days, providing links from Mansfield and Alfreton to Chesterfield and Staveley. However there were always faster and shorter links between these places, so the few passenger trains that ran these routes ceased as early as 1930. Part of the Stockley Trail, that used to be a railway line. There’s a lot of these paths around here – straight, wooded, narrow. The route was also known as the ‘Doe Lea Line’, as it ran along the valley of the River Doe Lea; situated in an industrial heartland with mining and chemical works, it was once one of the most polluted rivers in England, with Dioxin levels upwards of 1000x safe levels. Nice. It’s quite a pleasant walk now, through trees and green fields; I still wouldn’t recommend paddling in the river though! At the Bolsover end of the Stockley Trail, just behind an industrial complex, is a piece of ‘modern art’ entitled “Breaking The Mould”. It was created in 2000 by the artist and sculptor Andrew McKeown, who works primarily in iron and steel, and has created many local-interest pieces around the country; this is the first of 21 in a series called ‘Changing Places’, which symbolise the changing nature of many of the UK’s ex-industrial heartlands. The “Breaking The Mould” sculpture. It was a little odd to come across it by accident. 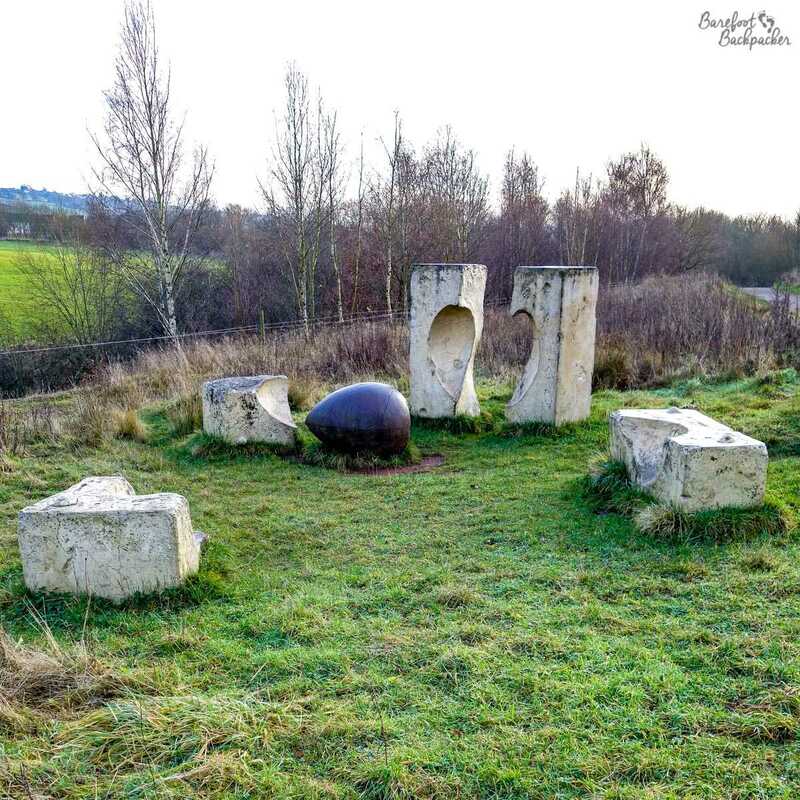 More industrial-themed public art is visible at Poulter Country Park, around 7km East of Bolsover, and which lies next to the wonderfully-named railway station of ‘Langwith Whaley-Thorns’, named after several nearby villages whose names ultimately refer to ‘woodland’. This is very much in the mining heartland on the Nottinghamshire / Derbyshire border; a series of villages and small towns very much off the standard tourist trail now suffering with a post-industrial identity crisis – this is Brexit Britain. Just south of here is the Polish town of Shirebrook, once a major mining and railway town, now home to the much-maligned Sports Direct empire. One of the sculptures in Poulter Country Park – “Flint Flower” by Ewan Allinson, said to represent archaeology & the nearby wild flower meadows. The park itself isn’t that big, but is quite hilly and forested. It feels like the sort of place I’d have done cross-country races around at school. 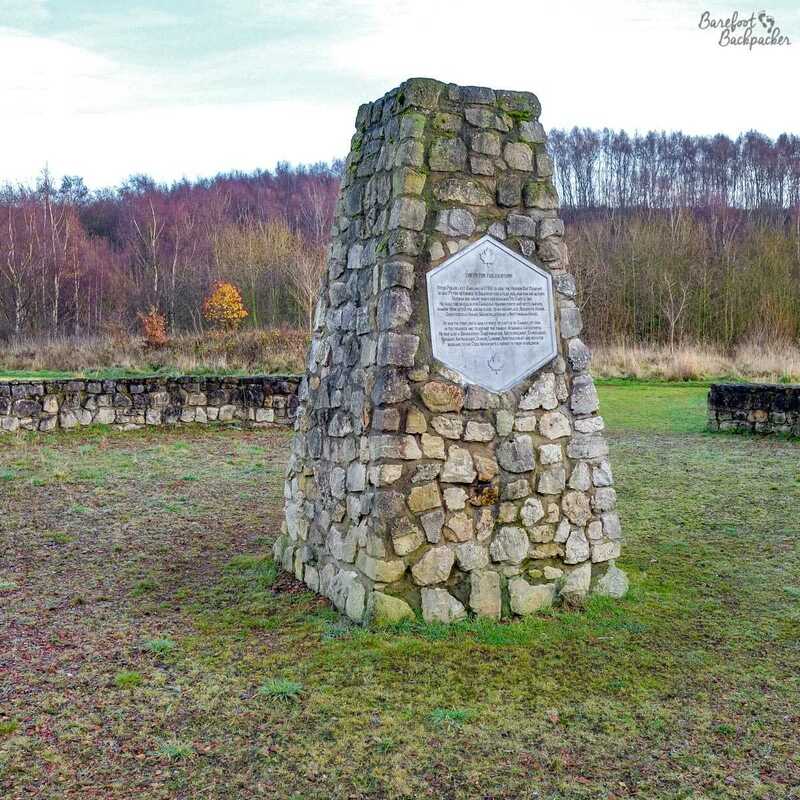 It stands on the site of the old Langwith colliery, once employing 1,300 people and which closed around 1978-1980. There was also a munitions factory here in World War 1, and there’s a memorial stone to two explosions there which killed a total of six people, as well to two Canadians whose fighter plane crashed in the area in World War 2. “Industrial Fossils” by David Mayne, black ferns that represent the coal of Langwith Colliery. Apparently. Around the park are a series of footpaths, including the ‘Archaeological Way’ short-distance footpath that links Shirebook with Creswell, the next village to the North. 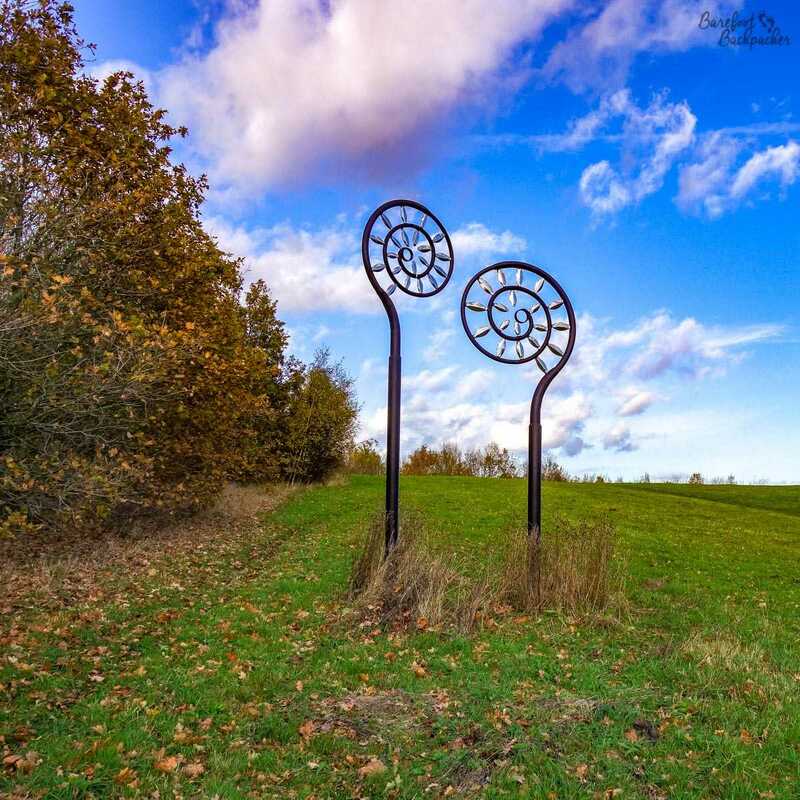 Part of these paths encompass the ‘Art Along The Way’ Sculpture Trail, that showcase several different pieces of public art that highlight a different aspect of the area, from the wildflowers to the industrial heritage, via the stone age. “Top Of The World”, also by Ewan Allinson. This represents the stone age history of the area. The name comes from it being at the highest point in the park, so you can sit down and look out over the two counties. Popular with schoolkids. 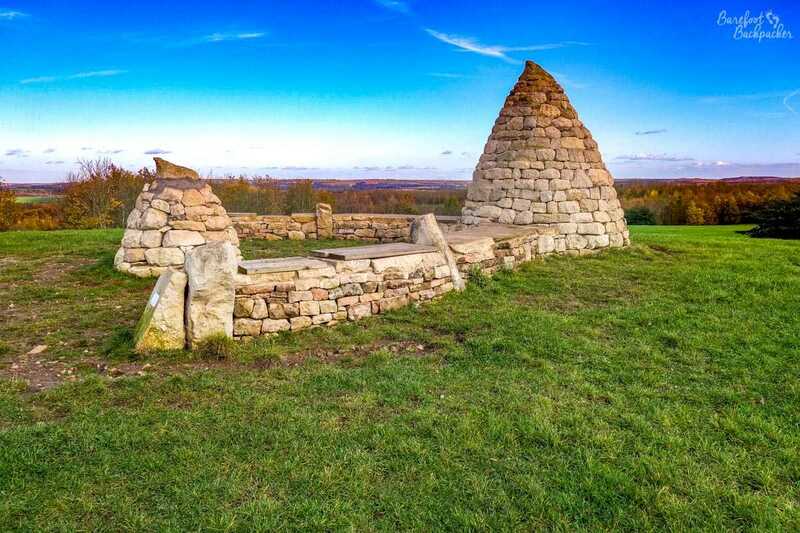 The stone age connection is the main draw to nearby Creswell, 5km to the North of Langwith. Another ex-mining village, it’s partly notable for its ‘model village’ (a purpose-built village for workers of the nearby coal mines, in a similar style to places like New Lanark and Saltaire, but on a much smaller scale), but its main claim to fame is Creswell Crags, a limestone gorge dotted with caves that have been used by humans for some 60,000 years, making it amongst the oldest-known habited places in the UK. 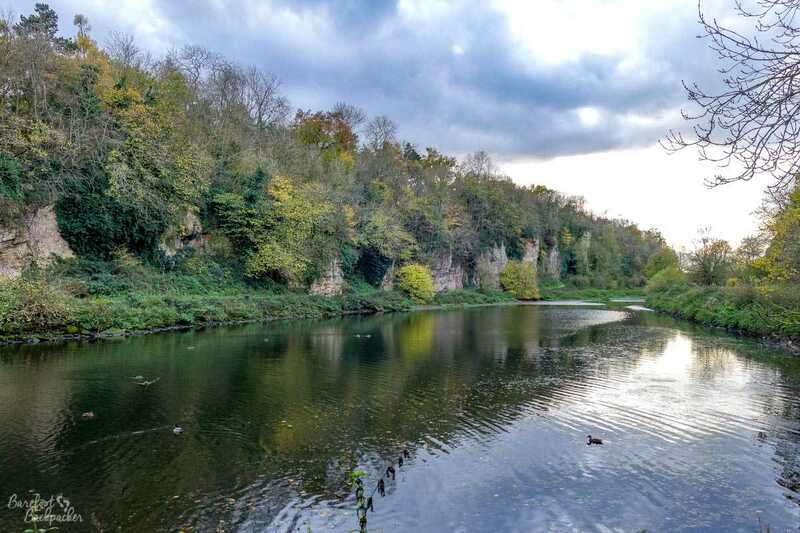 Overview of the limestone gorge at Creswell Crags. Geeks will note this is also the border between Nottinghamshire (left) and Derbyshire (right). Each of the caves, which are now closed off and visitable only under supervision in a tour, has been the location of a number of interesting finds, from flint tools and worked animal bones to some ancient cave art – dating to just under 13,000 years ago and the most Northerly in Europe, as well as being one of the very few examples found in the UK at all. The area was a place to shelter from the weather during the Ice Age, as well as providing a watering-hole for reindeer and bison, so it was a logical place to set up camp. 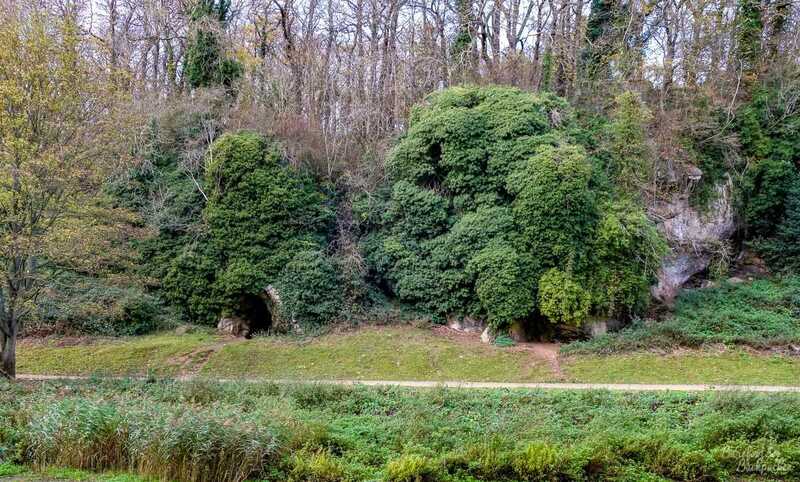 I liken these small caves to hobbit houses. 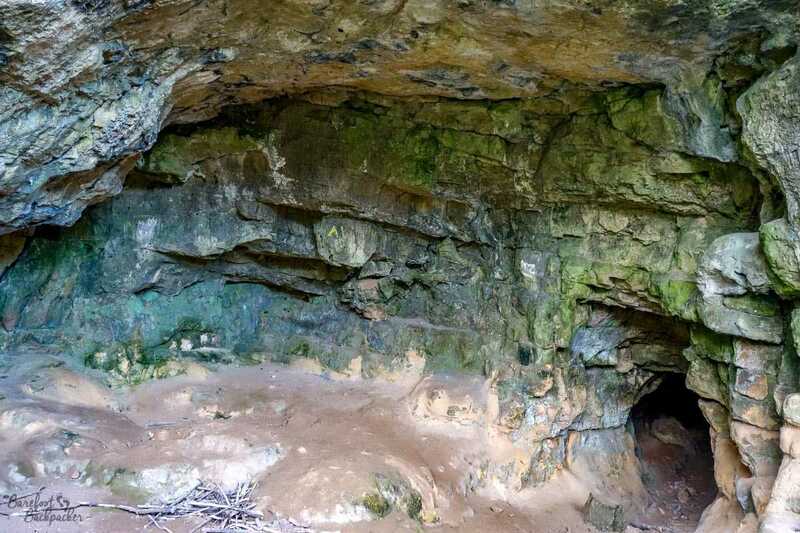 One of the caves is known as ‘Robin Hood’s Cave’. While, of course, there is no evidence that Robin Hood existed, never mind stayed here, it’s certainly well within the area of his alleged activities so the idea that he and his band could have hidden in the caves here from the King’s soldiers isn’t too much of a leap of faith, and the idea of such is certainly present in some of the earlier stories (as told in the 1400s-1600s). You can visit the caves on a tour, but most of the time they’re gated off. This is just inside the wonderfully-named “Mother Grundy’s Parlour” cave, where a 50,000 year old hand-axe was found in the 1920s. Although small, it’s a pleasant place to have a wander around. The site is free and open to the public; there’s a visitor centre and small museum on site that do charge (as is parking), as well as a shop/cafe but it’s definitely an interesting place to spend an hour or so. It’s sometimes quite amazing to learn the sort of things that exist in what on the map seems to be a cultural and economic wasteland. Authorities visited: Derbyshire, specifically the Bolsover District. Dates Visited: 17 December 2016 and 11 November 2017, amongst other times.